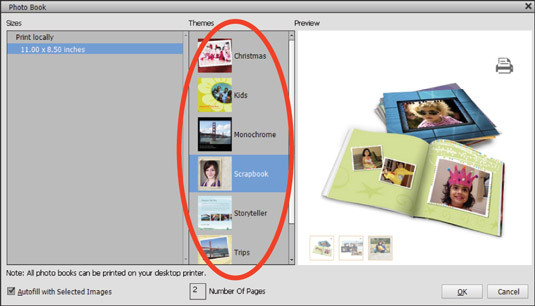 Creations such as photo books, greeting cards, photo calendars, and photo collages that you assemble from the Create panel in Photoshop Elements are intended for output to either print or screen sharing. In the Organizer or in the Photo Bin in the Photo Editor, select the photos you want to use for your creation. Sort photos or use keyword tags to simplify finding and selecting photos you want to use for a creation. The Create panel opens in the Panel Bin. The minute you click a creation you’re switched automatically to the Photo Editor. Click an option for the type of creation you want. You can click Photo Book, Photo Calendar, Greeting Card, Photo Collage, and so on. After you select the kind of creation you want to make, a wizard opens where you choose the options you want. Select a size for the output in the left column. Select a theme for your creation. Many of the creation options enable you to select a template. When you click a creation option on the Create panel, the panel changes to display choices for various themes, backgrounds, and borders. You make choices by clicking the theme or background. Most assets, such as themes, are not installed with your Photoshop Elements installation. When you select an asset such as a theme, it’s downloaded from Adobe’s website. A message window informs you that a download is in progress. Be patient and wait for the download to complete before moving on. Elements automatically creates the number of pages to accommodate the number of photos you selected in the Organizer or Photo Bin. Select your options in the Create panel. Click OK. Pages: Add or delete pages. Layouts: Choose a layout. You can click different layouts and view the results in the wizard. The Layouts panel offers choices for many layouts. Graphics: Add artwork and text with the Graphics panel. Explore each item and choose options available for editing your creation. (Optional) Select options in the creation’s Advanced mode. Up to this point, you couldn’t make any changes to your photos (other than sizing and rotating) because the wizard interface is separate from the Organizer and Photo Editor. Click the Advanced Mode button in the upper-left corner of the wizard, and you have access to the Photo Editor Tools panel. You can now make edits on any photos in the creation. 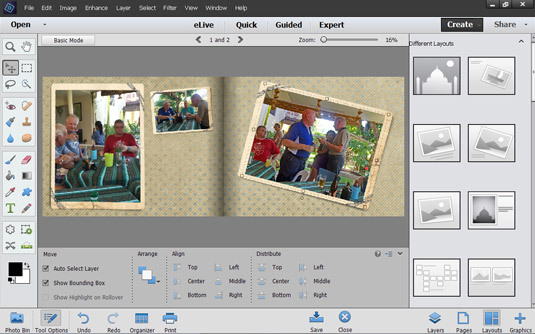 Advanced mode provides you with the Photo Editor tools to edit photos in your creation before saving or printing. When you click Advanced Mode, the button name changes to Basic Mode. Click the Basic Mode button to return to the Create panel. Save: Save the file as a Photoshop Elements Project. You can return to the project and edit it at a later time. Print: Before the output is generated, look over the preview of your creation. If you’re using Advanced mode, click the Basic button at the top of the window and scroll through the pages to preview the creation. Whether you want to create a photo book, a calendar, or any one of the other first five options in the Create panel, you follow the same steps. When you make a creation that will ultimately be shared with other users or sent to an online service for printing, you must first select the photos you want in your creation. For example, creating a photo book by clicking the Photo Book button on the Create panel first requires you to select photos. The reason you must first select photos — in either the Organizer or Photo Bin — is because the creation process involves using a wizard to set the attributes for your creation. You leave either the Organizer or Photo Bin when you begin the process; Elements makes no provision for you to drag and drop photos from the Organizer or Photo Bin to the wizard.